Headaches are one of the most common complaints people experience and they can cause significant discomfort. This can then lead to reduced productivity and lost work time. However, headaches can be hard to treat because they can be caused by many different things. If TMD is causing your headaches, Dr. Mayoor Patel can help. Here are three clues to look out for to determine if TMD is the culprit. Headaches occur after jaw activity. One of the most important clues that link headaches with TMJ is the fact that intense jaw activity sets off your headaches. This can include chewing tough foods, opening your mouth wide, talking for long periods of time, and other activities that put your jaw muscles to the test. Clenching your teeth before, during or after headaches. One kind of jaw activity that’s worth singling out is teeth clenching or bruxism. Bruxism is a parafunction–something you’re doing with your jaw that you’re not supposed to do–that is often associated with TMJ and TMJ-related headaches. Bruxism can occur during the day or night, so it may be responsible for those morning headaches you get. This might also be related to sleep apnea. Jaw pain, clicking or restricted movement. Temporomandibular joint disorders often manifest in the jaw first or at the same time as they cause symptoms elsewhere. If you experience jaw pain , that’s a sign you have TMJ that may be causing your headaches. Jaw sounds like clicking or popping occur because the cushioning disk in the temporomandibular joint is out of place, but can slip back into place–that causes the sound. Restricted jaw movement occurs when the disk won’t slip back in place, but rather interferes with the motion of your jaw. Here’s a quick test you can perform at home to get a better sense of TMD and if you might have it. While the pencil test is not foolproof, it can give you a hint that TMJ might be contributing to your headaches. Next time you have a headache, gently hold a pencil between your teeth. If it changes the pain you’re feeling–either lessening it or increasing it–then it’s likely that TMJ is contributing to your headaches. Unfortunately, sometimes we can only track down the causes of headaches through a process of elimination. If your doctor is treating you for the supposed cause of your headaches but you aren’t experiencing results, then it’s likely that there’s a true cause that hasn’t been tracked down yet. 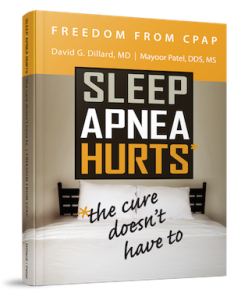 Contact Dr. Mayoor Patel at Craniofacial Pain & Dental Sleep Center of Georgia for more information on TMD and how it might be causing your headaches.